I have wanted to get one of those track saws for a while now just couldn’t fork out the 600 for the original green machine. with the recent introduction of a track saw by the other green company (Grizzly) I did some research (online reviews, online videos, demos, different model user manuals for features, parts diagrams and features) and found the Scheppach CS-55 model to be a suitable match for me. I have had good past experience with Scheppach products (my slow grinder) and from looking at their online website (although poorly constructed) it seems on-par with Grizzly in many ways (there are also numerous products that are identical from both mfg.) which is good for long term parts/service purposes as I think Grizzly is very very good in that sense (ease of getting replacement parts). Since Grizzly’s track saw is still not available in stock, and since their overall price was $50 over the alternative, I ended up going with the Scheppach model. I also ordered an Oshlun 48teeth replacement blade to have a spare at hand (since these are not readily available at the BORG I don’t want to be stranded without a blade in the middle of a project). My use for this will be sporadic and not too often so I don’t need a power horse that will run 24/7 nor do I need all the bells and whistles, just a solid saw that will do what it’s supposed to do with safety in mind. all seems to be as expected and in working condition. it definitely does not have a high-end quality feel to it, and feels rather plasticy but in terms of functionality it’s mostly there. It lacks some of the functionality other models have like stronger motor, variable speed, and some accessories that I suppose would come standard with other models are only available as “accessory pack” for this one. I personally will make the accessories I’ll need for this one so opted not to get any additional add ons. motor doesn’t seem to have a quick change carbon brush slot, for long term maintenance you’d have to open up the motor cover – no biggy, just found it curious. plunge action is awesome, setting depth of cut is convenient and safe – no need to flip saw guard halfway and drop saw down on part to be sawed. the operation on this one definitely feels like a huge improvement. unfortunately I do not have any shop time as of late, but I do have 1 project that I would like to address, so hopefully I will get to test drive this a bit more seriously. Not that I would be willing to pay full price for the green machine (or even for a used one), but after playing around with this one at this price range, I actually find the price tag on the higher end models more realistic with the attention to details that they include. But pound-per-pound for the occasional use and comparing the basic functionality, I find this one to be a good contender for the serious hobbyist. I’ve been jonesing for a track saw, too. Just can’t bite the bullet….even if it’s a blue one instead of green. I’d love to hear how this saw performs over the course of a project, though. What about the rails? Do they have longer lengths? When you’re joining them together are they solid? I want a track saw too. It will be interesting to see how this plays for you. unfortunately unlike the other brands which carry the rails everywhere, I was not able to find any source for the Scheppach rails, other than Grizzly (still unavailable at this point in time). I’ll take measurements and would be interested to check against Makita and Festool rails to see if they can interchange (I believe they can) albeit much more expensive (thought I would like to have a full 100” rail setup to rip sheet goods lengthwise). Good luck Sharon. It will be nice to have an operation review. Sweet! Thats going to make working with plywood much easier . There is also a product called true track. 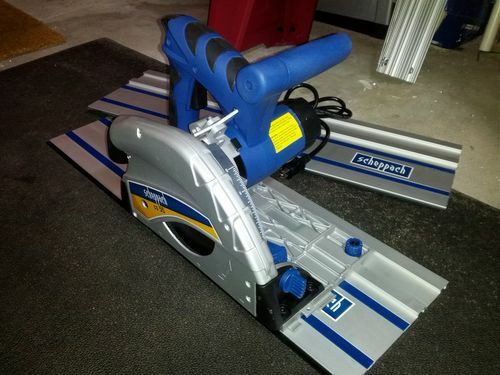 It is made in Ohio and utilizes your own CS on an adapter and turns it into a track saw. They sell add-on packs (don’t they all) to create a kind of sacrificial saw station that folds up into about the size of a folded saw horse. Check out their website. i noticed that Woodcraft carries it too. Don’t have one, just thought it looked neat and has a low price tag (comparatively speaking).